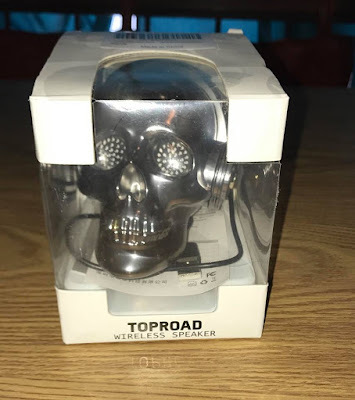 We received this Cool Skull Wireless Speaker for a review from Toproad. My oldest son has been collecting skull decor for a couple years. I believe he is going through his young adult phase at 35. He absolutely loves this Skull Bluetooth Speaker. He has thanked me many times and always has it on. With him living in my upstairs apartment, I hear his music anytime I have my music off. This is a unique handmade design. It is an awesome wireless stereo speaker. It has cool LED eye lights. You can use this at home, at a party or play your audio books on it. You can take this speaker with you everywhere. This speaker has the latest 4.1 bluetooth technology with CSR8615 bluetooth module-UK with SIG Bluetooth Certification. It can easily be connected to the laptop, tablet, iMac, iPhone, iPad, iPod, kindle, android smart phones and cars via the bluetooth compatible with smartphones from every generation that has Bluetooth. The speaker has an instant connection and a Bluetooth range of ten meters. 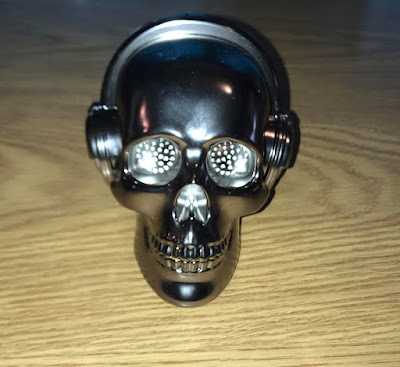 The skull speaker was made using high quality materials. You will get a perfect crystal clear sound with the wideband audio. A thumping bass your teens will love! This Bluetooth speaker has a built in 1150 mAh rechargeable battery. It will last up to 24 hours for night light or up to 6 hours of music play time with one full charge. It has a universal micro USB charging port design. The high quality material of this speaker is light weight, making it simple take along with you when leaving home. It was hand filled with polymer resin integral forming under vacuum at-0.2 MPA and then hand-painted. It is absolutely cool! You could simply use it for decoration at home and get lots of compliments on it. What a unique looking speaker! You are correct and it could just be used as a conversation piece if you happen to not have anything Blue tooth-like me. I can definitely see this becoming very popular! This sounds like a great speaker, my eldest daughter received a Bluetooth speaker for Christmas from a relative but it doesn't last long on a full charge �� 6 hours would be more than enough for her to be able to enjoy her music, the highlight aswell would be an added bonus �� Thanks for sharing! I would enjoy something similar on my desk. This looks ike a great Speaker. The Design is so cool and unique. I may need to have one to test if it's really good. omg my sister would love this! I have never seen this design before. And it also sounds like an amazing speaker! The sound is really good. It would definitely provide a unique conversation piece. What a fun speaker. It would make a great gift for a college dorm or for someone who has a thing for skulls. I really like how long it lasts on one charge and the LED lights are a nice bonus. This is a really unique speaker! I can imagine there are many people who would love to have this, in fact I know a few skull fans who would go crazy for this. That looks pretty neat. Definitely, something that could be used in a man cave or teen room. This looks pretty cool! The LED lights give it that extra touch! 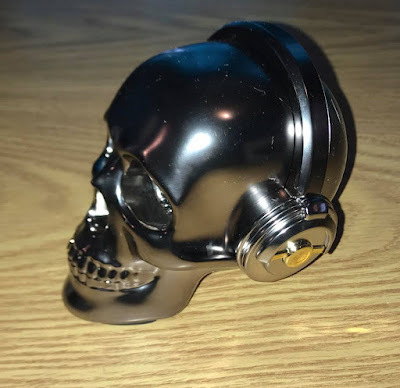 My sons has a collection of skulls too and this would be perfect for him! I love that the eyes light up and it handmade and painted, very cool indeed. Wow! This skull speaker is quite unique. Manufacturers have really thought of everything. I'm glad you found something that will fit into your sons collection and is practical too. That's such a cool speaker! Perfect gift for boys, I bet they'd love it! This is such a cool gadget. I love the skull design! Wow, what a unique design! I imagine it would be super cool to use in October, and make spooky sounds come out of it. This looks pretty neat! It would be perfect for a Halloween party (although that would be months away!). Anyway, I will check this out, and its never too early to purchase a good bluetooth speaker! This is so very cool! I know my oldest son would absolutely love this!